DN : 65 - 300 mm. Air – Flow : 1.01 ~ 178 m3/hr. 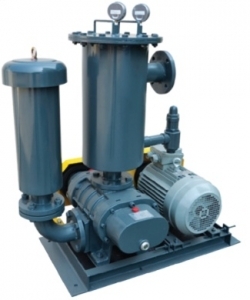 Features: By advanced technology of design and manufacture to reduce the noise, vibration, for high environment temperature working condition , design oil lubrication for driven gear and bearings ; Shaft seal design by double oil seal, v-ring and piston ring to guarantee completely oil-free air. Application: Dehydration of water from paper in paper industry, PSA (pressure swing absorber) process for oxygen, nitrogen carbon dioxide, carbon mon-oxide and others, vacuum drying process, vacuum recovery system. Unloader and others.